The sentence you've pulled from Wegman's argument misses out on a significant thrust of it, that it is increasing numbers of cyclists that provide the political impetus for increasing investment in infrastructure. 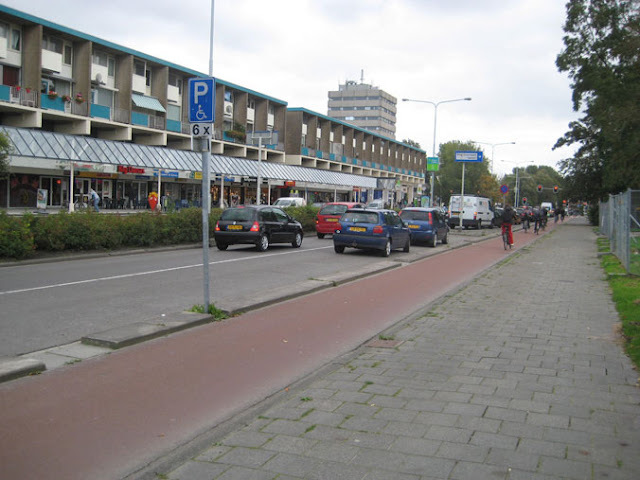 While I would fully agree with you that the high levels of cycling in the Netherlands are due to the excellent infrastructure, I think that to argue that the direction of causality in the numbers v safety argument must be reversed is also missing something. I would argue that this thinking is flawed, in assuming that the causality is uni-directional even over time. I would suggest that actually causality here is bi-directional, with an increase in infrastructure & perceived safety helping to cause increases in numbers, and increases in numbers causing more spending on infrastructure & driver awareness & better perceived safety, which causes increases in numbers, etc. Thus the 2 factors have, I would feel, interlinked, mutually re-inforcing causality. To achieve results *both* aspects - infrastructure & numbers - must be advocated for and promoted. Only if both sides are pushed can the 2 together enter into that virtuous spiral of increasing safety & numbers which the Netherlands saw. I agree that causality must go both ways to an extent. It is clearly the case that the effect that Wegman talks about, the large numbers of cyclists creating the political pressure for better facilities, is very strong in the Netherlands. This is manifested in the fact there that large expenditure on cycling is in no way politically controversial – like large expenditure on the NHS in the UK, it is seen as benefiting everybody. You also see, furthermore, the pressure for the character of the cycle provision coming from groups that would have no influence on cycling provision in the UK, because of the social breadth of cycling there. See for example this piece by David Hembrow where grumpy pensioners criticise the steepness of a cycle bridge as being like "the Alps". This kind of thing drives the quality of provision there. We can't get anything like that pressure in the UK from the base we are at now of 1-2%, so we are more dependent on political leadership, which is in short supply. I don't totally discount the effect of promoting cycling through advertising, but I think that it will only have a real effect if it is simultaneous with obvious improvements in conditions for cycling. You can't do what TfL does, which is do the promotion, then say "It's still not worth providing decent cycle lanes because there still aren't enough cyclists." It requires more of a leap of political faith, which the Dutch made 40 years ago. David Arditti: Bear in mind that cycling rates in the Netherlands never collapsed to the pitiful levels in the UK (& Ireland - another country I'm interested in). I don't have the figures to hand, but I have a vague recollection from one of Hembrow's or Wagenbuur's posts that at its worst, dutch cycling levels were still order of 25% participation. Thus the dutch re-focusing then did not require quite the amount of political courage as it does in the UK today. Training should always be at the bottom of any safety pyramid. This is the order in which you should proceed. 1. Assess the risk - look at the infrastructure we have and see what the risks are. 2. Avoid the Risk - by redesigning the infrastructure. If you cannot avoid the risk completely. 4. Warn about the risk and provide training. But too many people jump straight to 4 thinking that you cannot do anything other than 4.